Rose Valley is the tourist nickname of the Dades valley in the southern Morocco, at the foot of the High Atlas between El Kelaa M'Gouna and Boulmane Dades. Its economy is mainly based on agriculture (grain, barley, corn, potato). It owes its name to the presence of roses hedges. Roses, whose smell spreads throughout the month of May, a few days before harvest, give a special tone to this valley. Damascus rose, resistant to cold and drought, was introduced by pilgrims returning from Mecca to the X century. It is grown for local consumption in the form of rose water, as for export and the perfume industry, in the form of gasoline and real roses. Annually three to four thousand tons of roses are harvested during a week that ends moussem (festival) of Roses. The rose water is produced on site, but cosmetics and soaps are now made in factories in Marrakech or Casablanca. The distillation is carried out in two factories in the region, that of Kelaâ, located in an old Kasbah. Roses are also exported to the perfume industry. Finally, families traditionally producers use, for perfume, cooking, and body treatments. This 7 or 8 day trek from Marrakech offer you a chance to discover a part of the southern Morocco, walk along its valleys, villages, kasbah’s and meet with the Local Berber people of Ait Ata tribe etc. Transfer to your hotel/riad. Overnight with breakfast. Departure at 8 am, the Directorate Tichka pass (2260 m); the highest road pass in Morocco, magnificent panoramic view, after the pass the landscape will be semi-desert of the great southern Moroccan slope. Lunch in Ouarzazate and continuation to Kelaa M'Gouna before arrival at the Dades Valley with its beautiful kasbah. Home stay overnight, 7 hours drive. Leaving this beautiful valley for a barren landscape for 3 hours, finally we discover the beautiful green valley of M'Goun. Lunch at the edge of the valley to the village Ighrm Aqdim and again 1h30 walking to the village of Aguerzaka. 5:30 walk. Night in tents. Leaving valley to go up 300 meters to the pass that leads us through a forest of juniper to the Ameskar Valley. Again a beautiful valley of Almdoune, with a hundred houses shaped adobe kasbahs. Lunch in the vallée Temtda, and then continue on a great trail to the village Alemdoune 1700m. 5 hours walking. Night in tents. Slowl descend to the oleander valley (plan to cross the gorge with sandals). Lunch at the river near the village Aznag. After 1h walk we reach the village of Boutarhrar. 5h walk. Night in tents. A beautiful walk in the heart of the rose valley with its kasbah's, which are becoming more numerous. The rose fields are emerging around cereal crops. Going down the Tourbist valley and then to Hdida village. Night in the village. 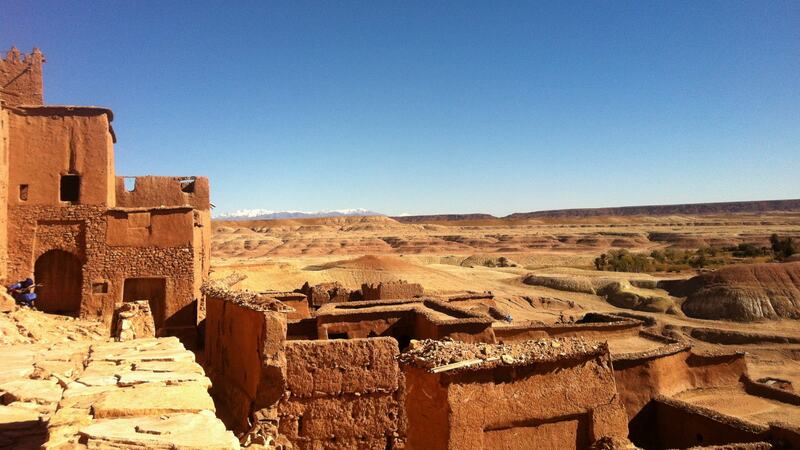 Transfer by car with kasbah of Ait Ben Haddou visit, famous by many movies filmed there. This 11th century kasbah was declared World Heritage listed by UNESCO. Arrival in Marrakech. Night in hotel with breakfast. 6:30 drive. Mules to carry your luggage during the hiking.